Things are feeling pretty festive at Chez Bishop - the decorations are up, the cards are posted and the presents have been wrapped...Hubby just has one more day of work on Monday & then it will truly feel like Christmas. We have a gorgeous weekend ahead of us: hubby is running his first ever 5k park run tomorrow morning ahead of his marathon training starting in the New Year, Bert and I plan to walk to meet him after his run, get some fresh air & burn some Christmas calories, then we have a lovely lunch date with our gorgeous newlywed besties Danni & Charlie, I can't wait! On Sunday we're planning a mammoth 9 mile country walk (with a lovely lunch with our friends Amy & Dan sandwiched in the middle) and then plan on heading home to an evening of Christmas DVDs & red wine once Bert is tucked up in bed. Perfecto. This year we've had to slightly alter how we decorate our house for Christmas, with an inquisitive toddler like Bert around we figured we couldn't get away with our beautiful (and expensive) pre-lit twig tree in the living room, as we have done on previous years, for fear of it not lasting longer that 5 minutes before it is broken, or Bert is broken: one or the other. Instead, we've turned our dining room into our own little Christmas grotto, with tree, fairy lights and wrapped gifts galore and kept things simple in the living room. Our fireplace is totally out of bounds to Bert thanks to a large fire guard that clips around it, so to make the room look festive without the worry that Bert will toddler-destroy it all, we have decorated only the fireplace. I think you'll agree it looks very festive! 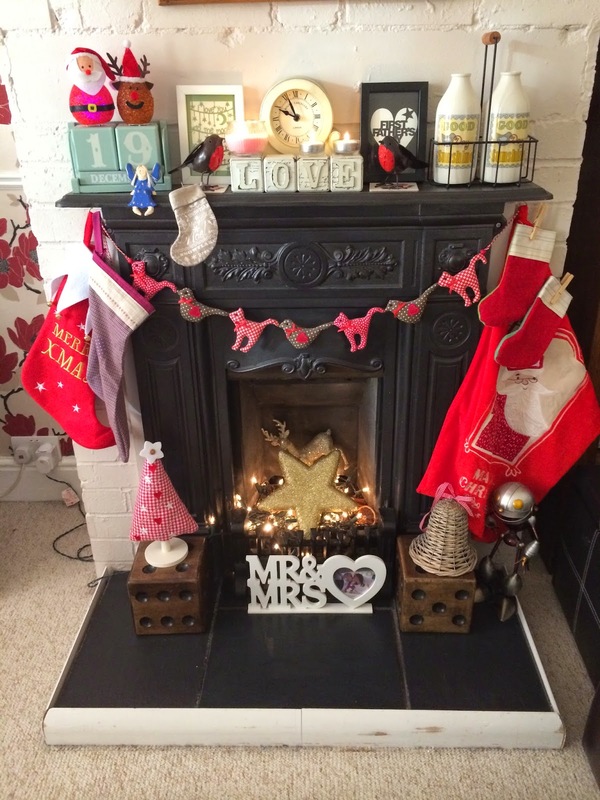 Our festive fireplace complete with stockings, Santa's sack, a wicker Christmas bell, fabric Christmas tree, glitter star and stag, fairy lights, light up Santa and Rudolph, Christmas angel, a pair of robins, mini stocking and some mulled wine scented candles...Mmmm it even smells like Christmas. Whatever you're up to this weekend I hope its full of happy things and lots of festive cheer! 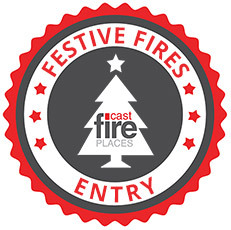 This post is my entry into the Cast Fireplaces 'Festive Fires' competition.